Perhaps you have one in your home. At least you likely know someone who does. There is not a whole lot that is desirable about honey colored furniture these days. Perhaps someday it will come back, but until then, DIYers the world over will continue to dedicate themselves to painting, stripping, sanding, and otherwise removing all trace of anything resembling those delightful orangey tones. When it comes to pianos, the best thing, the sanity-saving thing to do, is to paint over it. Really, if you are thinking about refinishing your piano you should probably paint over it. But, if you just can’t bring yourself to do it – if wood grain is just something you don’t want to mess with, then read on, my crazy friend. Read on. Why in the world would you stain a piano?! We inherited this piano from my in laws, and as soon as it was in the house people began asking when I would refinish it. Because, as it turns out, you can’t simultaneously run a diy blog and own a honey colored piano. Such is life. But, here’s the thing. I just couldn’t paint it. Don’t get me wrong, there are some lovely painted pianos out there. They look great. But I cannot paint a piano for the same reason that I cannot get a tattoo. Inevitably I will wish I hadn’t, and both are really difficult to remove. So I less than enthusiastically puzzled over stain choices. Then one day I learned about Weatherwood Stains, a product that reacts with the wood to produce a weathered gray look, resembling old wood. I was fascinated, and for the first time I caught a whiff of that elusive excitement I needed to enter upon a pretty monumental project. Admittedly, you could totally have skipped that part. But you might find it interesting if you are on the fence yourself. Also, I think it is important to introduce the product that is at the heart of this project. Guys, this is one of my favorite things, ever. This isn’t a sponsored post, but the good people at Weatherwood Stains did share this project with me. And let me tell you – it takes a pretty incredible product to make me undertake stripping a piano. So let’s get to it, shall we? *This post contains affiliate links for your convenience. You can read my full disclosure policy here. Slowly and very methodically disassemble what you can down to the sound board. Personally, unless you are a piano technician, I would leave the rest of it alone. Tip: Place each set of screws in its own sandwich bag and note on the outside with a sharpie where they go. Photograph each part and write the corresponding photo number on each bag. By the time you are done you will likely have forgotten all those details. Sand the flat surfaces. This is personal preference, but stripper is some gnarly stuff to work with, and I prefer to reserve it for surfaces that cannot be easily sanded. Cover the keys and soundboard as best you can during this process. Tip: Ignore the bad example of the photo above. Stripper works best if it is allowed to stay moist and work into the finish. Cover or wrap the surface as you work and allow it to thoroughly penetrate. After a suitable amount of time, as determined by testing, scrub the stripper and dissolved finish off using a soft scraper and wire brush. Follow up with after wash using a scrub pad to remove the residual stripper. Be sure to wear chemical resistant gloves, safety glasses, and a respirator mask while working with these chemicals. They are serious stuff. That last step is going to take you a long time. Be sure to allow the newly stripped piano to sit for a couple of days to thoroughly dry out. You don’t want to try to work over an area that was recently exposed to those chemicals. Unlike other stains, Weatherwood Stain is applied without wiping back. Apply enough stain to thoroughly saturate the wood, then stand back and watch the magic. That’s the fun part. Here’s a video introducing that process in a little more detail and giving some background if you would like. Can you tell that I’m painfully awkward on video? I have a very strong dislike of being in front of the camera. Part 2. This one is a time lapse of the stain doing its thing. Here’s a few photos of that process. Weatherwood notes on its website that if the wood you are staining is a soft maple the reactive stain will produce a purple color. Their simple solution is to coat the newly stained wood with hydrogen peroxide and let let it soak in and dry. Here’s a quick video showing how well that process works. For the finish I used Weatherwood’s Dead Flat Varnish, per their recommendation. Take a stroll down your local Lowes or Home Depot and you will realize that a flat varnish is a tall order. The only flat varnishes of which I am aware are General Finishes water based topcoat and this flat finish by Weatherwood Stains. Now, I realize it may be nerdy to get excited by a varnish, but I am totally doing the happy dance over this stuff. I expected it to have some small amount of sheen because that’s what finishes do. This one does not. It is as close to perfection as it gets. I will definitely be using it again for future products. Take a look at this finish. That is with three coats of finish! I’m telling you, I’m in varnish heaven. Now, to back up a moment: Weatherwood Reclamation stain is very environmentally friendly and VOC free, but it does have an odor. I let the piano sit for a week or two in the garage to allow the smell to dissipate before moving on to the next step. To be fair, it didn’t really need that long, I just needed to find enough people to lift the piano back into the house so it worked out! Always apply varnish in a clean environment. I finished the piano inside the house and did not have a problem with any strong smell. If you documented each part of step 1 then step 5 should go pretty smoothly. I made the decision to reassemble our piano without the bottom panel, leaving the lower part of the sound board open. I like to think the piano looks like it has just washed ashore on the beach. My husband says it evokes more of a found-in-the-woods feel. Either way, it has a deconstructed, returning to nature look to it that I love. I realize it is not for everyone, and expect to hear a few “oh my gosh, she ruined that piano!” comments, but I’m cool with that. This was an artistic project that I consider an expression of the things I love: nature, music, wood. All those lovely elements. It also pairs well with my love for photography. One more note: When you sand a piano you will need to replace the decal. You can order a new one online. The process is not so much a stick-it-on-and-go thing as a sweat, tears, and cursing ordeal, but take it slow and it will be fine. I am actually still working to remove the last bit of residue from ours so it will look a bit more seamless. I love the look of the piano. It now fits so much better with our aesthetic. My kids were thrilled to have it back in the house because they love to play it, and by “play” I mean pound on the keys energetically. Here’s it is in all of it’s washed-ashore or left-in-the-woods glory. I even topped it with a piece of driftwood and some sea glass in what is definitely an over emphasis of a point. The framed piece of music over the piano is from Beethoven’s 9th Symphony, which is my favorite piece of music. I created it by enlarging it onto a piece of engineering paper printed at Staples. 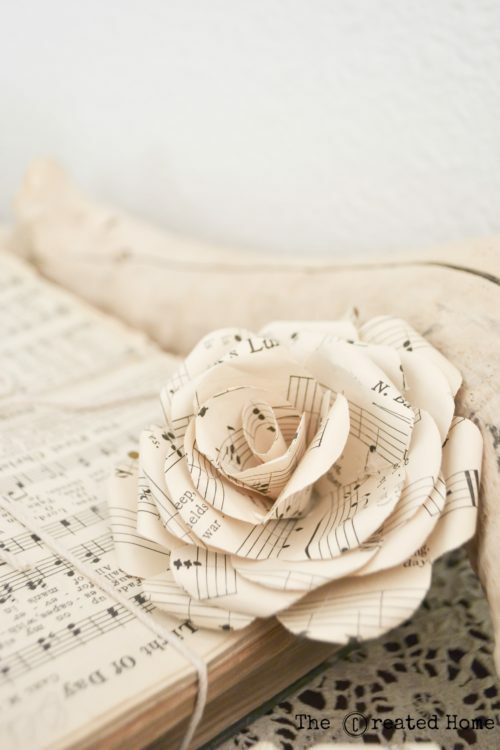 The roses on top of the piano I folded out of sheets of music from vintage church hymnals. I love that it is a one of a kind piano now. Thanks for reading! I have been asking myself if it was all worth it as I look at our newly finish piano, and the answer is yes. I don’t think I would have been happy with it if I had used any other product. I wanted something special, and the Weatherwood stain fit that perfectly. I will definitely be using more of their reactive stains on future projects. If you love the barn wood look it is well worth checking out. 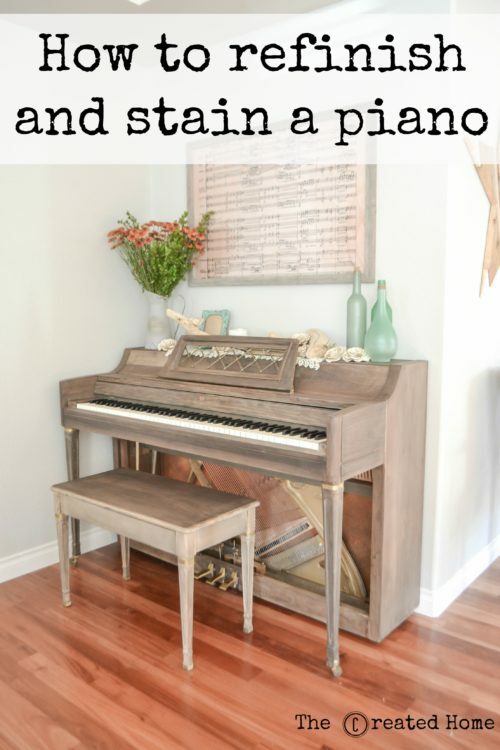 If you have an old piano that has to be stripped and refinished, either because you plan to restain or because it has years of built up paint, my advice is to set aside a good deal of time to finish the project and not try to rush any part of it. It is definitely a doable job, and doing it yourself will save you a lot of money, but it is not a speedy process and it requires a ton of attention to detail. Wow! How gorgeous is this!! My in-laws downsized and also gave their piano to us, but unfortunately we can’t do anything to it since they might ask for it back. Fortunately though, it’s not too bad looking and isn’t honey colored😂 Good job!! Thank you! I am not sure I would have done anything if it were not honey colored! Haha! I am in love with this piano!!! Great job! This is stunning! I plan to use this page to hire out the refinishing of our piano, but can you please give me some more info on what file you used and how you enlarged the sheet music? I would so appreciate it!! Thank you, Kerri! I cannot recall where I got the music exactly. I Googled Beethoven’s Ode to Joy. I edited the image to look a bit aged, then took the file to a local print center and had it printed on a 24×36″ engineering print. I hope that helps! I love this project. I bought all the supplies except the stain and varnish. The price is killing me! Anyone know of a similar alternative to the reclamation stain thats less than $80? It’s not a small project, for sure! What you will want to look for is another reactive stain. There are other’s on the market – an increasing number, actually. I have tried a few, and I come back to Weatherwood because they have given me by far the best results. They are also really good about showing what results you can expect on different woods. I would say try a couple and see what you think. I would caution against using the vinegar and steel wool trick on this one, as you just won’t be able to control the results much with that and it will probably go very dark. Personally, I chose Weatherwood because even with a little higher cost for the stain, it was a massive savings over having the piano done (you may feel it worth it by the time you are done, haha!) Also, I needed to trust that it would work, or all that work would be for nothing. I hope that helps a little. Test some brands out and see what feels right for you. And definitely share a photo when you are done, please! Good luck! Your refinished piano is really lovely. I also have a honey-colored-piano, but mine is rather banged up. Near the bottom there is even some split and missing veneer. Is your piano solid wood, with no veneer? I’m new to this whole messing-around-with-furniture business, and I don’t know if it is dumb to try to refinish a piano with damaged veneer. (The optimist in me wants to believe that I can add gold bands, as you did, and conceal problem areas.) Also, is that same optimist really asking for trouble by thinking she might avoid stripper altogether? I want to do this whole project in the house, because when we moved in a year ago my husband said, “and we will never have to move that piano again.” Your piano, like mine, does not seem to have a lot of carved detail, but obviously you felt the need to use stripper anyway. Is it something I really can’t avoid, if I want to actually finish this project? Thank you in advance! Hi Mary! Apologies for the delayed response. Yes, my piano is a soft maple veneer. The gold bands are original to the piano, so unfortunately I can’t tell you much about adding those. You can repair damaged veneer. It is not a job for the feint of heart, and will likely never look perfect. I totally understand wanting to finish it inside. Pianos are so heavy! You may consider paying off a few strong men with pizza. 🙂 I found stripper to be the gentlest option to avoid eating through the veneer and risking damage to the piano. Those legs, for example, would be really difficult to sand without destroying detail. I hope that all helps. If you have any other questions please feel free to ask! Looks fantastic! I am not experienced with refinishing furniture. My piano has veneer, which you said yours is, but it also has lots of carved details. Will a stripper remove the orange stain from details very well? Also, can you estimate how many hours this took you – someone who knows what they are doing? I am researching this vs chalk paint. Chalk paint is obviously way easier, but your just looks so much more elegant! It will take some time, but yes, stripper is the best solution. I’m not going to lie, this took a healthy dose of hours. I’m not going to hazard an exact guess because it has been a while since I did it. But I’ll tell you that I spent a couple weeks on it, between doing the mom thing and other life commitments. 🙂 Good luck, and please share a photo if you decide to do it! Hello! So I’ve just started in on my piano project! Thanks to your blog I am following your steps/tools word by word! So I’ve dismantled the piano and starting in on the music rack and already having questions lol. When you applied the stripper what did you wrap it with to keep moist? How exciting! I didn’t wrap this one, which was something I would definitely do different. Wrapping slows the drying, which helps it remove the material more thoroughly. Had I done so I wouldn’t have had to fight it so much. For the legs and things where it’s really hard to get a sander I would just wrap it in plastic wrap. I used stripper all over the piano – wherever there was wood. Just be sure to keep it out of the mechanisms, of course. It’s a messy job! Good luck, and please let me know if you have other questions! Also did you use stripper on the entire piano first? I love this finished product!! And it makes me want to re finish my upright grand. Did you use a glass or anything on the bottom of yours? Or just not re attach the wood. I’m worried my kids would destroy that if left open, but I love the mechanical look. Thanks, Kati! I didn’t put any glass down there. My kids have definitely gotten down there and messed with the mechanisms, but it’s built pretty tough. I think it’s fair to say with kids there is always the risk that a finger could be pinched, so plexiglass could be a great solution. What did you use to replace the wood to see all the hardware underneath? Did you leave it uncovered? or put glass or plexiglass there? your project turned out beautiful btw. I have an Upright grand from 1902 that I want to re finish. I’m just beginning this process step by step! I love your work and writing. Good job! Thanks. Thank you! I know it has been a while, so I hope it went well. Please do share photos when you are done! How were you able to leave the brand of the piano after staining. I have the same brand Wurlitzer it is a baby grand . I removed the sticker and purchased a new one online. I don’t recall the site, but they are available! Hi. How did you apply the varnish? If you used a brush, what kind and did it leave brush lines or does this varnish level out? I used general finishes wipe on clear coat for another project and didn’t like the dragon lines from wiping it on. I used Dead Flat Conversion Varnish by Weatherwood Stains. If I remember correctly, it was a foam brush. That varnish applies super easy with no lines. I’m surprised to hear the General Finishes was streaking. I have had great luck with their products, with the exception of the Enduro-var finish. That one streaked.